Hello Friends! Happy Monday! 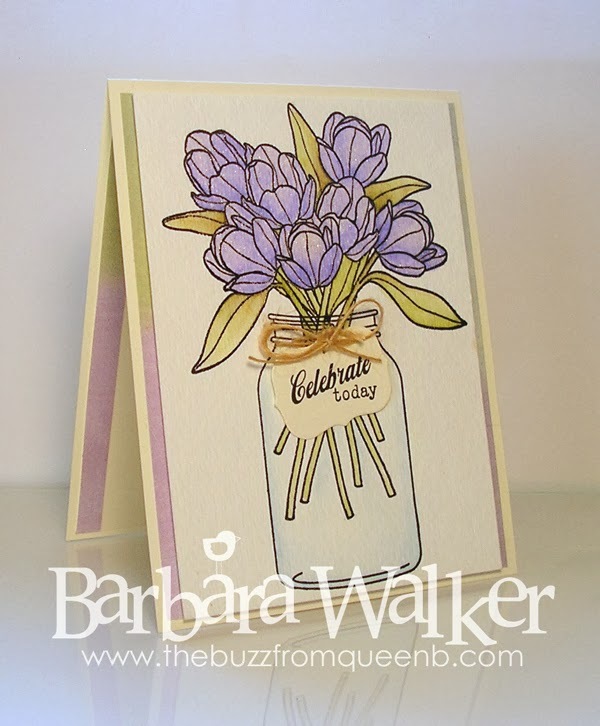 I know that many of you are buried under snow and dealing with awful weather right now, so I thought I would share a Spring-like card today. I hope it lifts your spirits. I created this card for my mom, her birthday is Wednesday. I don't use purple often on my projects, but it's a color I like to use on projects for my mom, since her birthstone is Amethyst. Since we love tulips, I knew this image would be perfect. I treated myself to the entire set of Tim Holtz Distress Markers...Merry Christmas to me! I've been wanting to use them to watercolor and this is where they make their debut! 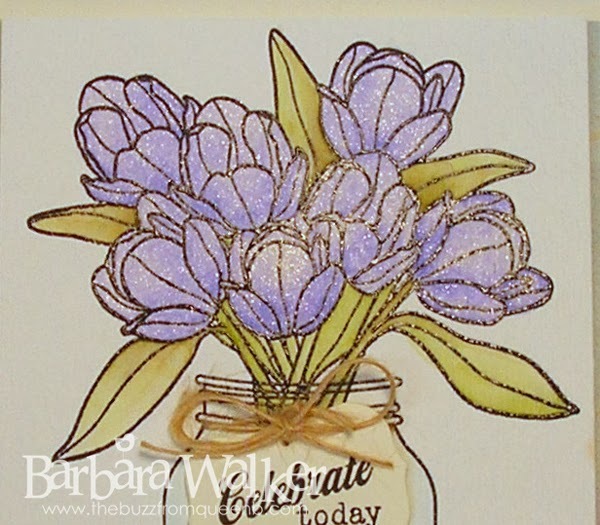 I LOVED coloring these tulips! It was so relaxing. I colored the image a few times before I liked the final result. I tried out several types of water color paper, all different price ranges and I ended up using some really cheap paper I picked up years ago at Walmart for one of my daughters to paint on. LoL! 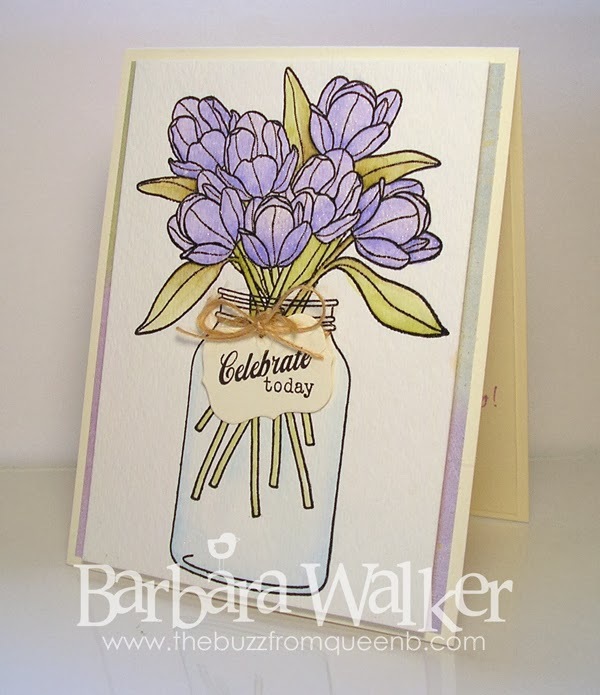 The clear embossing powder added a little shine too, which was nice. I tied on some twine using a technique that Kristina Werner shared. I poked holes in each side of the jar there and threaded the twine thru, then tied on a bow. 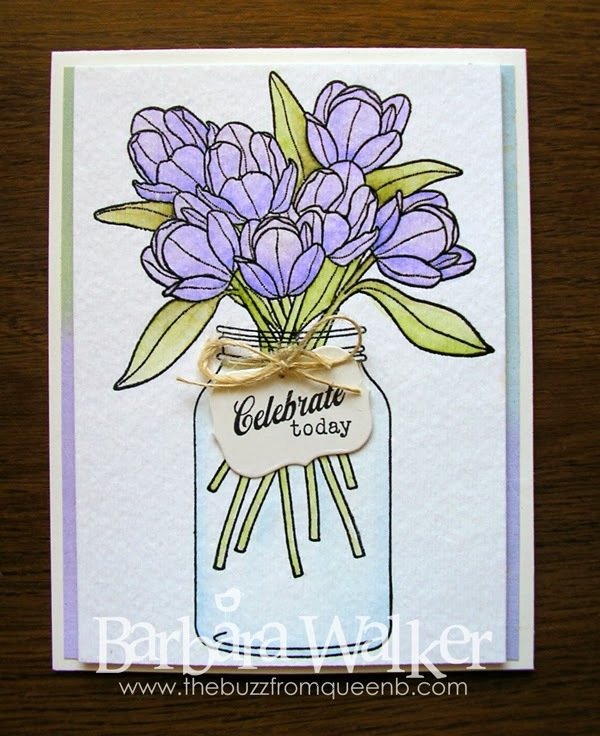 It's a really cool effect because it looks like the twine is going around the jar. I've had this patterned paper in my stash for YEARS. It's an old paper pad by Brenda Walton and I knew it would work nicely with the water colored image. I adhered my focal with a TON of dimensional tape. I used the kind on a roll, so I could get great coverage. The water color paper warped a tiny bit with the embossing and I wanted it to be perfectly flat. There are four rows of tape on this thing, plus small pieces in between. But it was all worth it because the focal panel is FLAT with no sagging or warping. Well, that is all I have for today. Thank you for dropping by. Enjoy your Monday! This is gorgeous Barb. Your mom is sure to love it. And have fun with your new markers. Oh my goodness, Barb, this absolutely beautiful. First up, totally impressed that you can use a waterbrush so effectively. (I'm very waterbrush challenged, so this is very impressive to me). Your shading is perfect. Your attention to detail never ceases to amaze me. Your mother will treasure this card, I'm sure. Wow! !